The linen liner is discolored. The dents, streaks and “scratches” all appear to be intentional and part of its original finish. The molding itself is 4 3/8” wide x 1 ½” deep and the roomy rabbet is 1” deep. It will need to be re-assembled. In gold finishes. x 13 in at it`s longest points. Appears hand made from multiple boards arranged to build the oval structure. Several spots of the gold finish were lightly retouched due to its age. It is sturdy and usable with areas of water-spotting and wear to the dry surface. The flat field is dappled with old fly specks. This is a magnificent 5 piece collection of 18-19 century miniature paintings from, a collector who used to collect paintings all his life. VERY GOOD TO EXCELLETLT CONDITION. This piece is the largest of this style we have ever encountered. New owner will need to add modern hanging wire. You can find us at antique shows, flea markets and doing appraisals all over the Mid-Atlantic region. 15 1/8" x 17 1/8" overall with 7 3/8" x 9 3/8" reveal and 8 1/8" x 10 1//8" back rabbet oprning One has a bright gold finish over well finished carving and the other is more rustic with barn gray glaze/wash. There is no glass but has wire for hanging. Beautiful Foliate Yellow and red tapestry w/ velvet green interior and large applied gilt bronze bow. Condition: Very Good Condition. Light surface wear and fraying to the tapestry. Light oxidation to the bronze. On back with supporting stick. 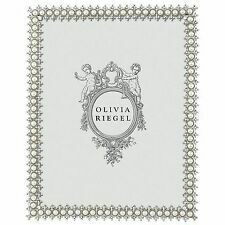 Originate from estate collection in Vienna. I try to describe any obvious faults as truthfully as I can. Material: sterling silver /marked: 835/. Weight: 38 g. 51 mm x 40 mm 5 mm. It is turdy and usable with minor looseness at the corners and shows rubs on the edges and corners right down to the wood. Antique Signed Litho Print Under Glass in Carved Wood Frame Buckingham Moak Co. Under the print at lower right is the penciled signature "Georges". Art Dept. Utica, NY.". Very good condition. ART NOUVEAU. RIBBON BRONZE. ANTIQUE OVAL PHOTO. MATERIAL: BRONZE. CONDITION: EXCELLENT, WITHOUT THE GLASS. EXQUISITE & REFINED PIECE. WEIGHT: 118.6 GRAMS. On the outside edge and will except a picture approx. 10 1/4 in. x 8 1/4 in. There is NO back board included. When you view an item it is just as we received it. There is NO backing board. Antique Picture Frame - Brass With Fine Leaf Decoration 7" x 9"
Antique Brass Picture Frame Size 7" x 9" Decorated Frame with Small Leaves Has back stand - to stand upright Has glass front. Baby Handprint Kit Baby Picture Frame, Baby Footprint kit, perfecto para regalos de Baby Boy, Top Baby Girl Gifts, Newborn Baby Keepsake Frames Especificación Marco de madera maciza 100%, Cristal de seguridad acrílico extra grueso para proteger fotos e impresiones Dimensiones del marco: 32cm * 32cm. Marco de madera maciza 100%, Cristal de seguridad acrílico extra grueso para proteger fotos e impresiones 1*PCS. The inner edge remains off-white and the scooped reveal will flatter most works of the middle 1900’s. You will note nicks and wear here and there. The surface is stable. 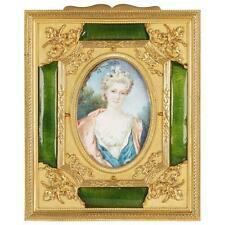 vintage Embossed Ornate metal and glass Picture Frame : 10 x 8 VERY pretty !!! 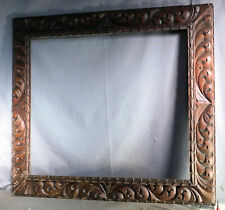 Beautiful Vintage Garden Theme Frame w/ Nailed Wood Design- Photo Size 4x6"
Antique Decorative White Wash Picture Frame w. Ornate Carved Top- 11x17"
21 ¼” x 25 3/8” overall with 16 1/8” x 20 1/8” back rabbet openings. One has a reveal of 15 ½” x 19 3/8” while its mate is 15 5/8” x 19 ½”. I try to describe any obvious faults as truthfully as I can. 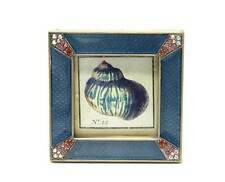 aprox size picture 14cm x 9cm. OF A PHEASANT. ANTIQUE BELGIAN NEEDLEWORK. INSIDE A WONDERFUL CARVED. 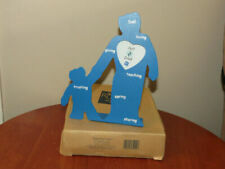 WITH COLLECTORS VALUE. FANTASTIC WALL DECORATION. I try to describe any obvious faults as truthfully as I can. It has expected surface wear from age and use and loose miters. The inner edge is accented by gold foil paper as was the practice then. It is in very good condition with dust and minor scratches. Antique Picture Frame - Brass With TWIST Decoration All Around 4-3/4" x 6-1/4"
Antique Brass Picture Frame Size 4-3/4" x 6-1/4" TWIST Decoration All Around.